Just in case you're new here, "Beautiful Day" posts are my effort to remind everyone that the world is an amazing place, and that it's filled with incredible people doing inspiring things. Don't watch the news. Unless there's a tornado warning. A 102-year-old former chorus dancer sees herself on film for the first time. A Pittsburgh detective's heart breaks, and he helps a couple of kids like no one else could. "Wanksy," a Manchester, England "street artist," finds a new way to get potholes filled, and quickly. A moment of anonymous generosity on the 6 Train, caught on video. A scientist accidentally invents sunglasses that correct color blindness, and a dad sees the color of his children's eyes for the first time. You may or may not know that I'm a big ol' bird nerd. (I caught it from my dad.) 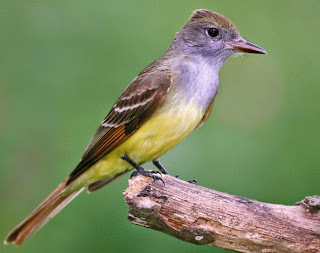 So, some of my personal good news last week was adding a new bird to my Life List, when a great-crested flycatcher landed on my back deck! This guy, here. Or a relative, anyway.